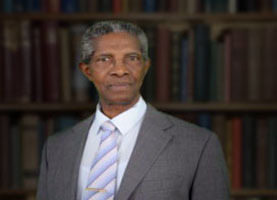 The Minister for Legal Affairs, Honourable Elvin Nimrod, informs the nation, that in accordance with the provisions of the Constitution of Grenada, the Government properly recommended to the Judicial and Legal Services Commission (JLSC), which is headquartered in St Lucia, that Sir Lawrence Joseph be appointed to act as the Attorney-General with effect from 2 October 2017. The recommendation was sent to the JLSC prior to the commencement of the leave date of the substantive Attorney General, Cajeton Hood. The minister is pleased to note that the JLSC has approved the recommendation for Sir Lawrence’s appointment for the period recommended. Her Excellency, the Governor-General has accordingly made the appointment of Sir Lawrence to act as Attorney General on the advice of the Judicial and Legal Services Commission. Sir Lawrence Joseph is therefore now the holder of the post of Acting Attorney General and has therefore relinquished the positions of Deputy Governor General and Special Adviser to Parliament. Cajeton Hood proceeded on leave on 2 October 2017 and the Cabinet and Government were never without the legal advice of the Attorney General or the Ministry of Legal Affairs at any relevant period.